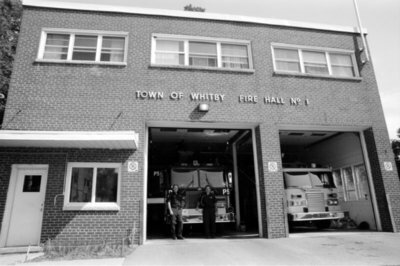 A black and white photograph the old Brooklin Fire Hall (6 Vipond Road) on June 2006. The new Brooklin Fire Hall (6745 Baldwin Street) officially opened on September 18, 2006. Brooklin Fire Hall, June 2006, Carl Ferencz. Whitby Archives A2013_019_004C.